These Cantonese Sweet Fried Dumplings are a staple dish for Chinese New Year. 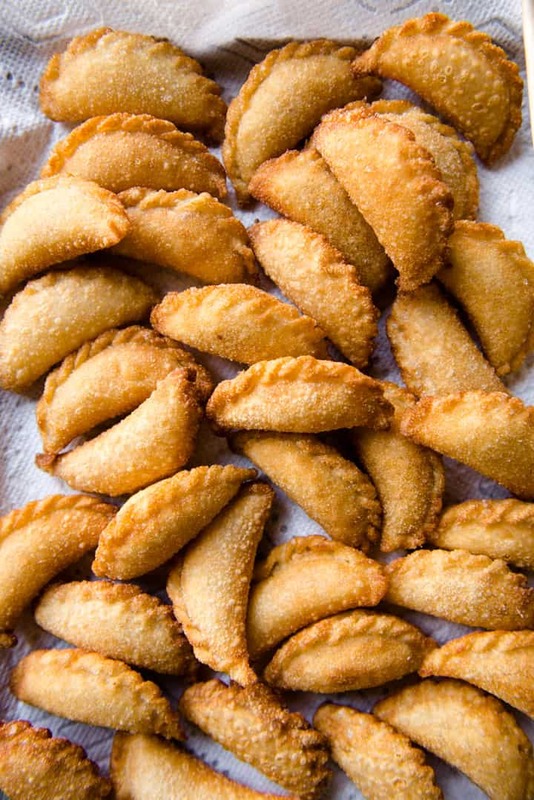 They’re filled with coconut, peanuts, sesame, and sugar. Be warned, they are addictive! With Chinese New Year around the corner, I want to share one of my favorite new year’s dishes: Cantonese sweet fried dumplings (角仔/油角). These dumplings are unique to Cantonese cuisine. 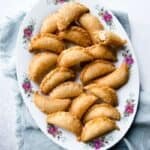 They are crispy on the outside and often filled with peanuts, coconut, sesame seeds, and sugar. Sweet fried dumplings (角仔) were one of the first dumplings I helped Mama Lin prepare. Although Mama Lin makes these every year, she does not follow a particular recipe. Rather, she judges the filling by the way it looks. 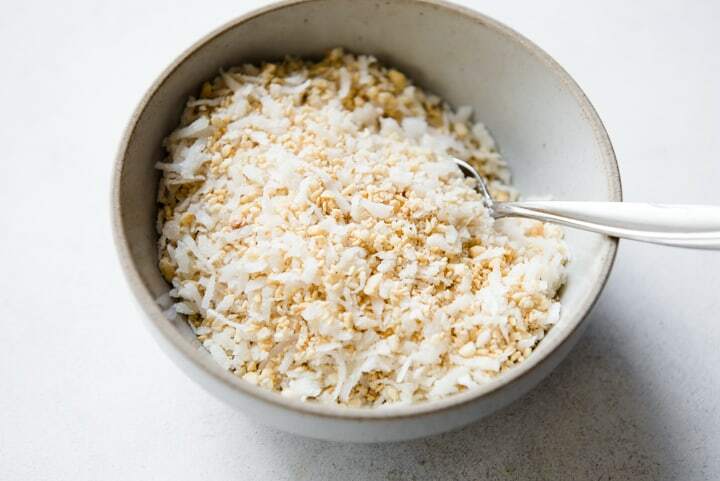 She pours shredded coconut, peanuts, sesame seeds, and sugar into a bowl. Based on the way the filling looks, she’ll add a bit more of this and that. Everything is done by memory. She’ll take a spoonful of the filling to see if it tastes good, and then we are ready to make dumplings! Below, I have put together a rough recipe for the filling. Please feel free to add more or less of any ingredient to suit your taste! 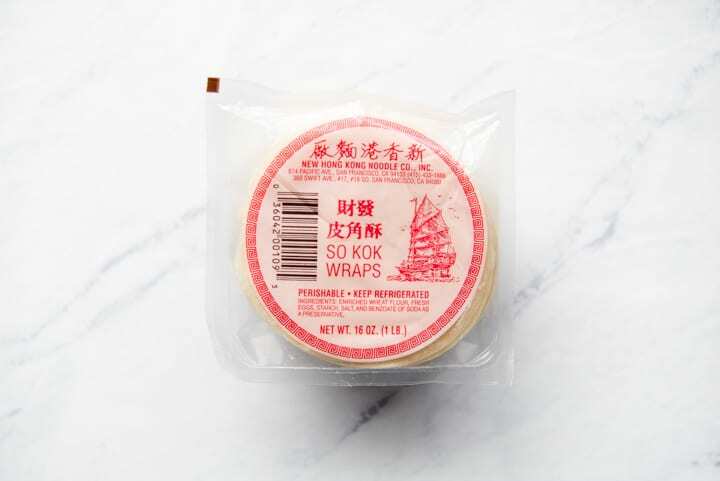 Dumpling Skins: Mama Lin typically uses New Hong Kong Noodle Company’s “so kok wraps” for the dumplings. Chinese supermarkets sell these only around Lunar new year. If you want to make these during another time of the year, look for thin circular wrappers. 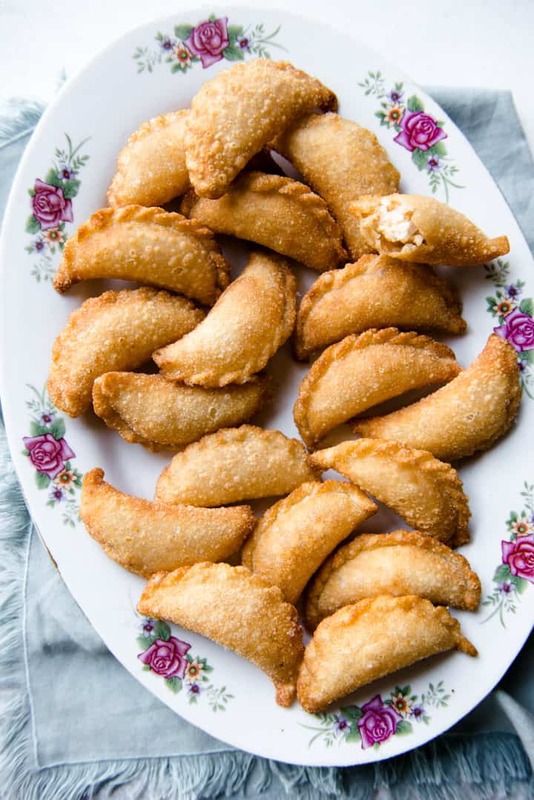 Filling for Sweet Fried Dumplings: The primary ingredients are coconut, chopped toasted peanuts, toasted sesame seeds, and sugar. 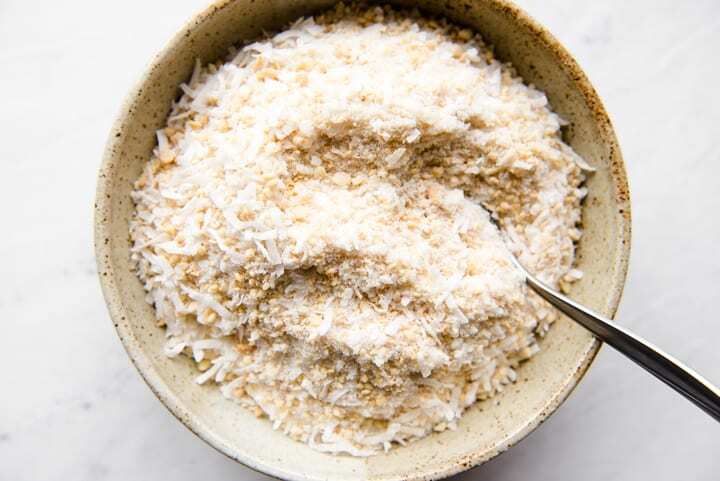 Typically, Mama Lin uses sweetened coconut flakes, the kind that you see in the baking section of a supermarket. Because the coconut is already sweetened, you don’t need much additional sugar. The top photo of the filling uses sweetened coconut, and the second uses unsweetened coconut. Notice that I had to add more sugar to the filling below. Once cooked, the dumplings that contain more granulated sugar will have a grittier texture, which you might prefer. Also note that sweetened coconut flakes tend to be more moist. As a result, the filling won’t puncture the dumpling skin as much when you seal the dumplings. Pleating the Sweet Fried Dumplings: I typically use water to seal the dumplings. However, you can use egg whites as well, but it will probably be more messy. You can pleat the dumplings like I have done in the photos above. 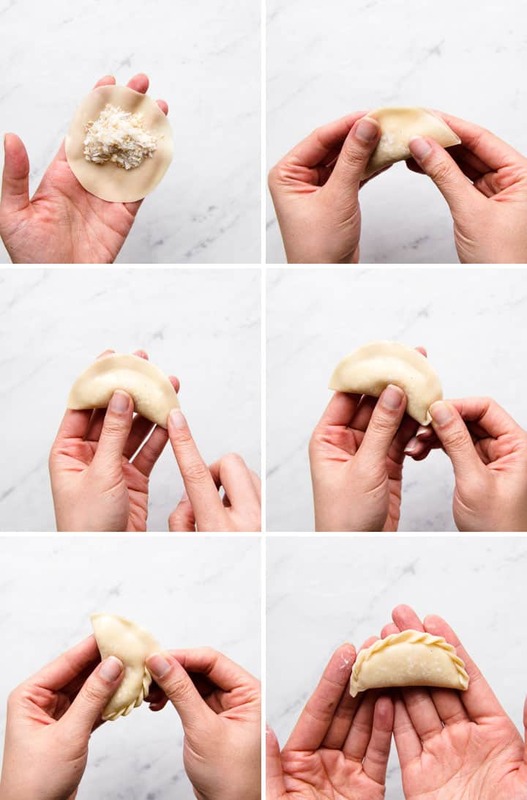 Alternatively, you can simply fold the dumplings in half and skip the pleating. Although the dumplings won’t look as fancy, the edge of dumpling will be crunchier once fried. 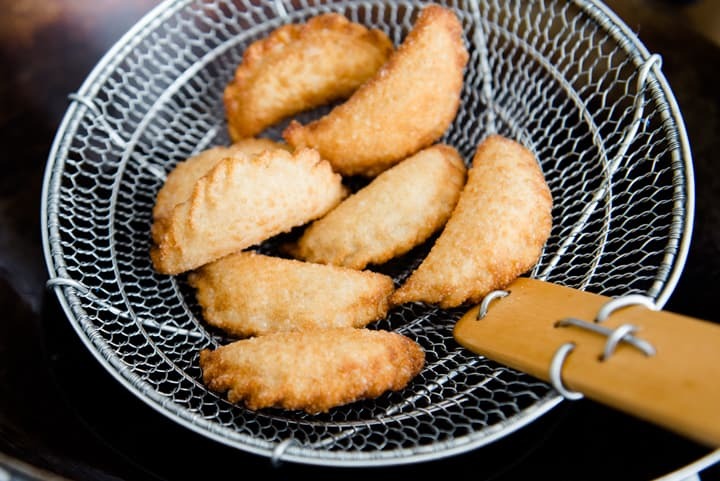 Frying the Dumplings: You’ll need to heat oil in a wok or a pot for frying the dumplings. 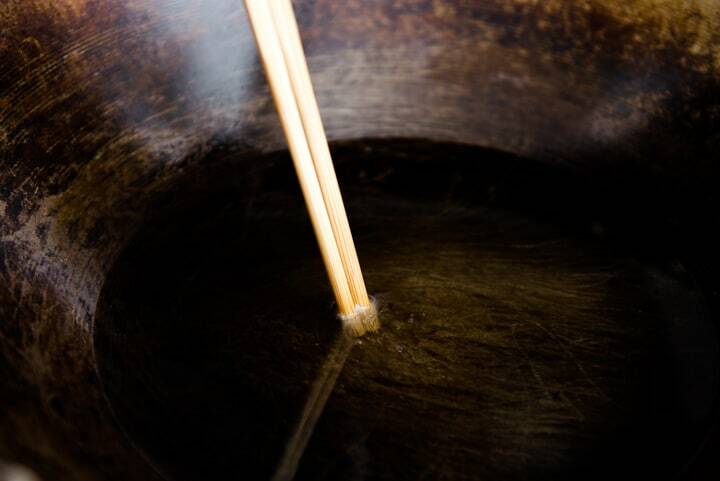 Mama Lin typically sticks bamboo chopsticks to the bottom of the wok to determine whether the oil is hot enough. If the oil starts bubbling around the chopsticks, the oil is ready for frying. Alternatively, you can use a thermometer to check the temperature. The oil was about 350ºF when I fried the dumplings. The first batch of these dumplings may take a few minutes (around 3). However, subsequent batches should take about 2 minutes. If the dumplings are browning too quickly, reduce the heat slightly.